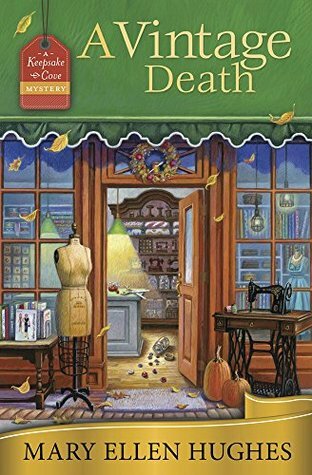 A Vintage Death by Mary Ellen Hughes is the second book of the cozy Keepsake Cove Mystery series. Each book in the series is centered around it’s own mystery so they can be read as a standalone if choosing to do so however there is some character building carried over story to story. In the first book of the series Callie Reed had gone to visit her aunt Melodie in Keepsake Cove where her aunt owned a collectable music box store. However shortly after arriving Callie found her aunt murdered and with faint hints of help from a favorite music box Callie had to find a murderer. Now Callie is settling into Keepsake Cove and running the shop she inherited from her aunt and settling into the community. Callie has planned to volunteer for the fall decorations and welcoming a visiting author but celebrations are halted when another dead body is found in the small community. When reading the first book of this series Keepsake Cove quickly became one of those charming little places that I wished I could visit with all of it’s specialty shops and cozy cottages so the setting alone is enough to return to book two. But this series also holds likable characters and good mysteries to go along with the wonderful setting too. There’s only a touch of paranormal to the book with the mysterious music box but it’s just enough to give the story an extra touch of uniqueness. Will be looking forward to seeing what Callie and friends have in store in the next installment. 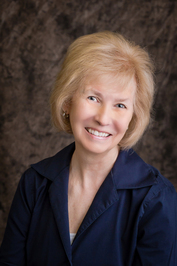 Mary Ellen Hughes is the bestselling author of the Pickled and Preserved Mysteries (Penguin), the Craft Corner Mysteries, and the Maggie Olenski Mysteries, along with several short stories. A Fatal Collection is her debut with Midnight Ink. Visit her at http://www.MaryEllenHughes.com. Ooh sounds great, Carrie!!! Just up my ally! Oh I like. I did see this series earlier but didn’t have a chance to start. Hope you continue to enjoy. I have both these books, so I guess I need to read them now. Wonderful review that has me thinking I should not have been putting this series off. Thanks Carla! It’s one of those charming little settings that I want to go visit…. of course all the murders are a turn off but then again we have that in real life all the time. That is so true. Wouldn’t it be wonderful if murder was only something to read about in Fiction.